The vangas are small to medium-sized perching birds thare are only found on Madagascar off the southeastern coast of Africa and Comoros - an island nation located off the eastern coast of Africa. 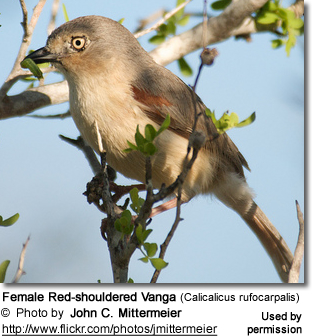 Vangas are small to medium-sized birds, varying from 12 to 32 cm in length. Most have strong, hooked bills similar to those of shrikes. The Helmet Vanga has a particularly large bill with a casque on top. Some species, such as the newtonias, have a small, thin bill. The Sickle-billed Vanga has a long, curved bill. Most vangas are largely black, brown or grey above and white below. 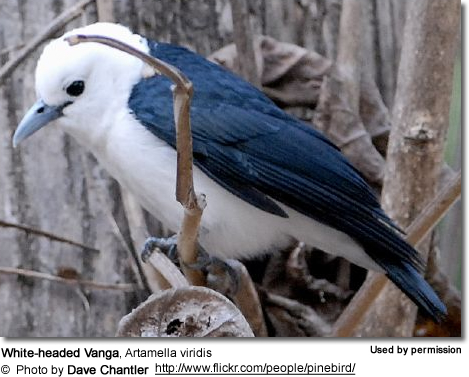 The exceptions are the blue and white Blue Vanga and the blue-grey Nuthatch Vanga. The Helmet Vanga is mostly black with a rufous back. Male Bernier's Vangas are entirely black while the females are brown. All vangas occur on the island of Madagascar, except for the Blue Vanga which is also found on the Comoros on Mohéli island and, at least formerly, on Grande Comore. They are resident (non-migratory) within their range. The feed on insects, earthworms, millipedes, lizards and amphibian; except for the Blue Vanga and Chabert's Vanga which may take fruits. 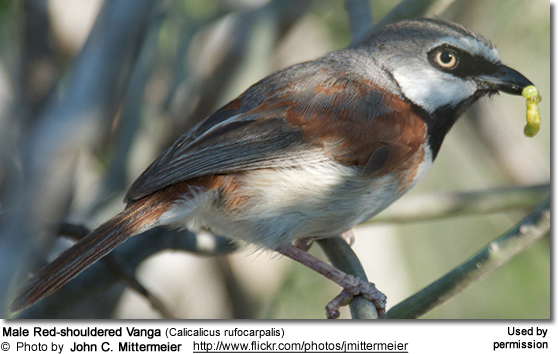 Most species forage in mixed-species flocks; except for the Hook-billed Vanga and Lafresnaye's Vanga, which tend to feed alone. Typically nest in in pairs; their cup-shaped nests are constructed out of twigs, bark, roots and leaves. 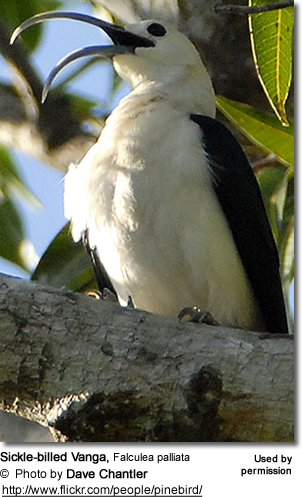 The Sickle-billed Vanga nests in groups and builds a large nest of sticks. Most vangas emit whistling calls. 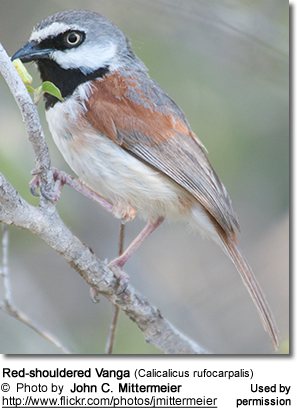 Red-shouldered Vanga, Calicalicus rufocarpalis - Regarded as Vulnerable. Chabert's Vanga, Leptopterus chabert - Relatively common. Comoro Blue Vanga, Cyanolanius (madagascarinus) comorensis. Bernier's Vanga, Oriolia bernieri - Regarded as Vulnerable. Helmet Vanga, Euryceros prevostii - Regarded as Vulnerable. Bluntschli's Vanga or Short-toed Nuthatch-vanga, Hypositta perdita - Only described from two old specimens and its taxonomic status questionable. Red-tailed Newtonia, Newtonia fanovanae - Regarded as Vulnerable.